Vintage - Gibson's Bone China, Staffordshire, Brown & Striped Teapot w/Lid, Made in the 1950's. 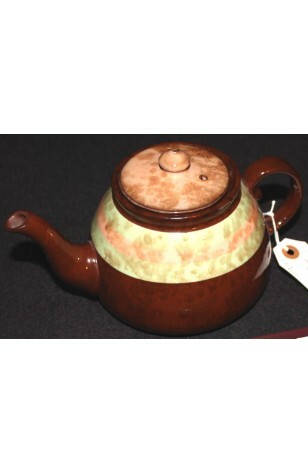 This great looking Teapot, made by Gibson's Bone China of Staffordshire, England, is a neat looking Brown, with Green and Beige Stripes below the Lid. Stripes imitate Marbling, and so does the Beige Lid. Knob on Lid is Trimmed with 22kt Gold. Teapot is in Very Good Condition (no chips, cracks, crazing or even wear marks). This great looking Teapot, made by Gibson's Bone China of Staffordshire, England, is a neat looking Brown, with Green and Beige Stripes below the Lid. Stripes imitate Marbling, and so does the Beige Lid. Knob on Lid is Trimmed with 22kt Gold. Teapot is in Very Good Resale Condition (no chips, cracks, crazing or even wear marks)..